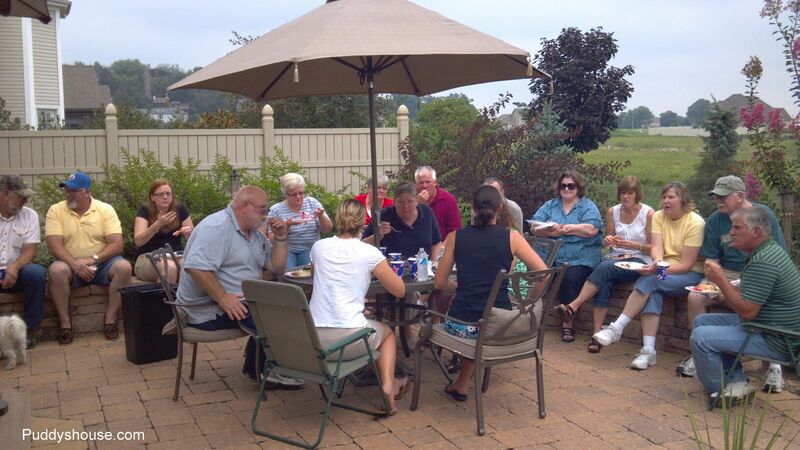 Bob and I decided to host our family for a Labor Day Weekend Picnic on Sunday, September 2nd. And, we also thought it would be a great time to recognize my Mom’s recent accomplishment of completing her Associate’s Degree. So, we invited everyone like a normal family picnic, but then I sent out a supplemental evite to everyone except Mom informing them that it would also be a suprise graduation party for Mom. We were very excited that Mom’s siblings (she is one of eight!) and spouses could all make it, and of course my siblings and their families too. So, we were expecting about 35 people. Fortunately, we lucked out and the weather cooperated and we had a nice day….it rained before the picnic, but cleared up in time to set everything up and enjoy. I thought everything was going well, and then my sister and I were finalizing our cake and cupcake decorating and Mom just walks right in the kitchen before the picnic was supposed to start. I just looked at her and laughed, when she walked right up to us and asked what we were doing! So, obviously not a very good surprise. Mom just said that now that she was college educated, she was smart enough to sort of figure out something was up!! My sister made the cake. 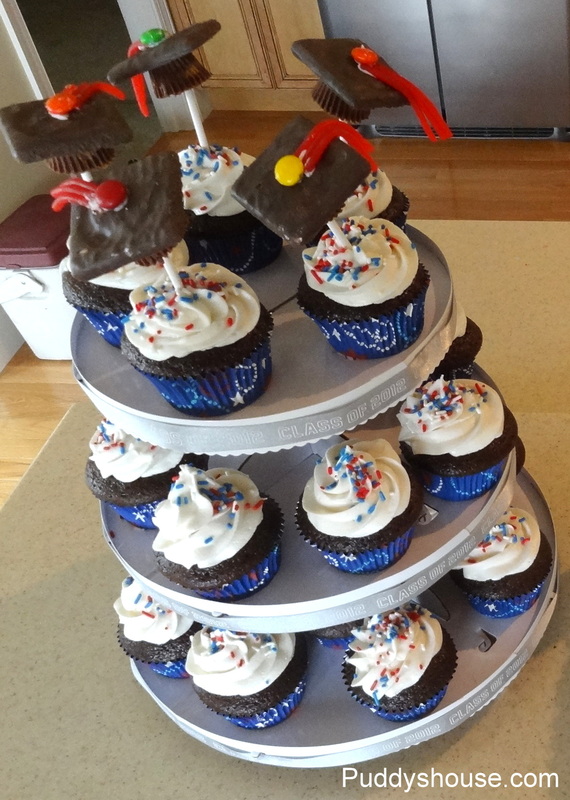 I made the cupcakes and then we coordinated the decorating. 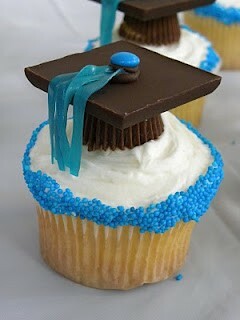 The little graduation caps on the cake and cupcakes were my first pinterest inspired creation! Yes, its terrible that I have not implemented anything else I’ve seen on pinterest, but I finally had a reason. I modified slightly by using the Reese’s, a fudge covered cookie, M&M, and then twizzlers. They aren’t nearly perfect, but I think they made a cute addition to the food and decor. 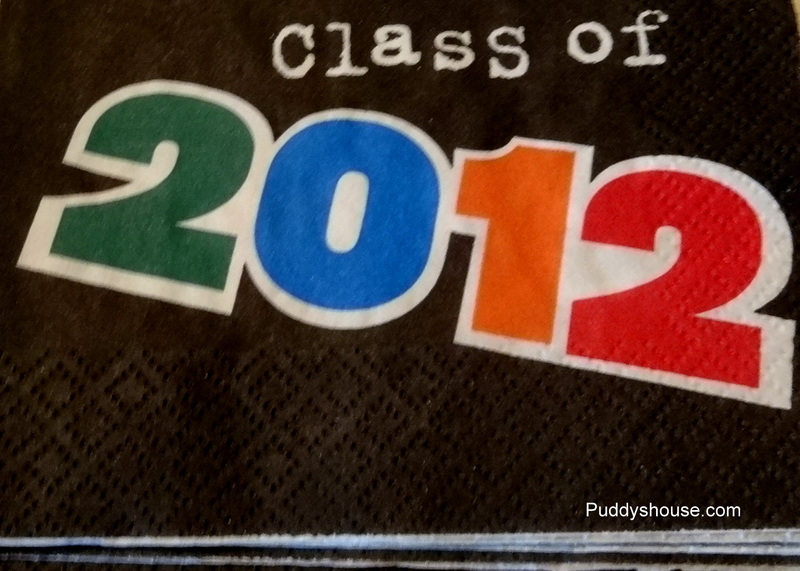 I also added the Class of 2012 ribbon to the cupcake stand. 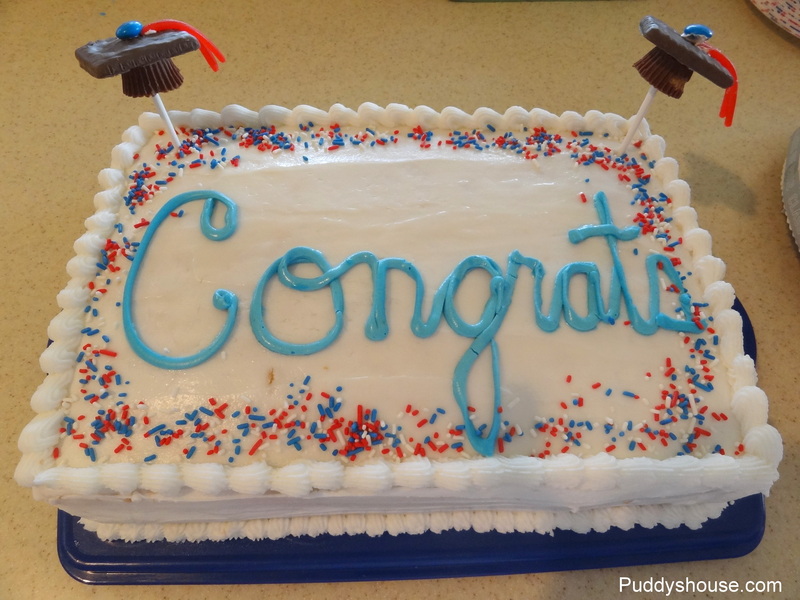 Even though we had planned the surprise for a few months, I failed in shopping for graduation decor in June when most stores had a good supply. So, many of the items we were just working with what was available in August and also what I had on hand. 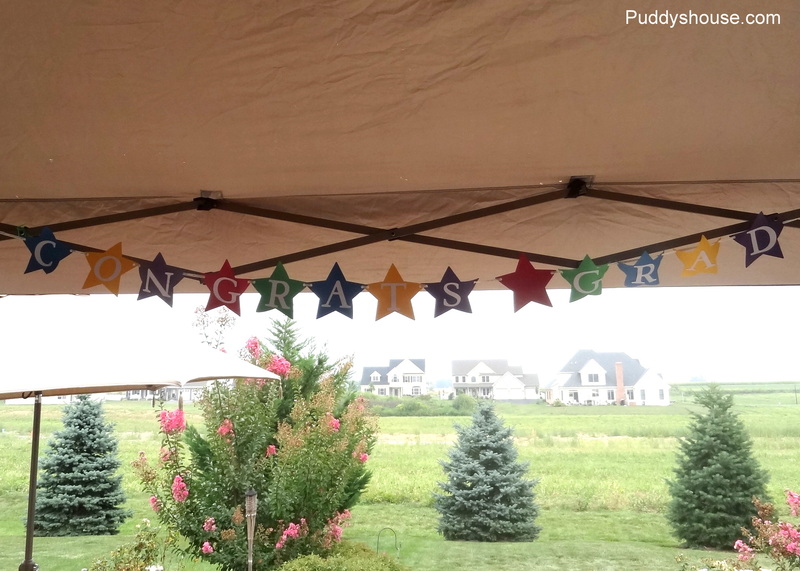 I made the Congrats Grad banner with some Congrats ribbon from the Dollar Tree, pre-cut stars from the craft store, and then I used my Cricut to cut out the letters. 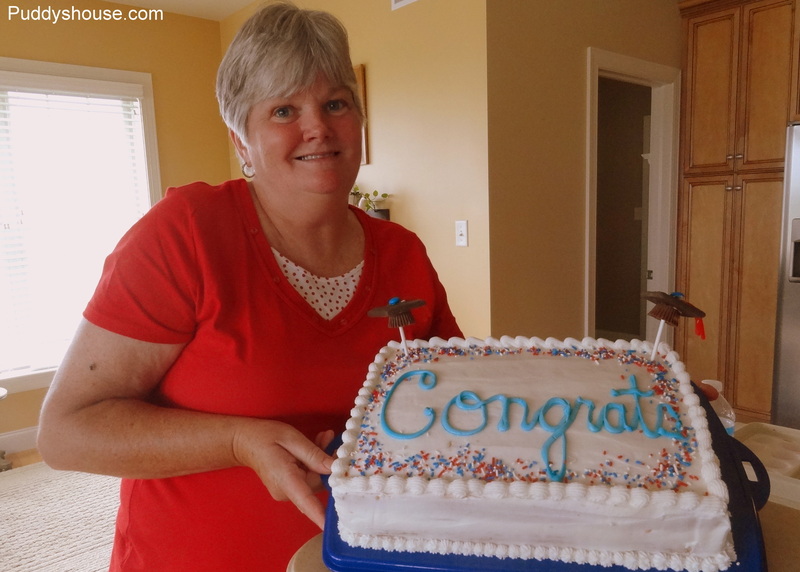 Even though she wasn’t too surprised, Mom still enjoyed the celebration. We had quite a crowd filling our patio. We also took the opportunity to get some family photos. 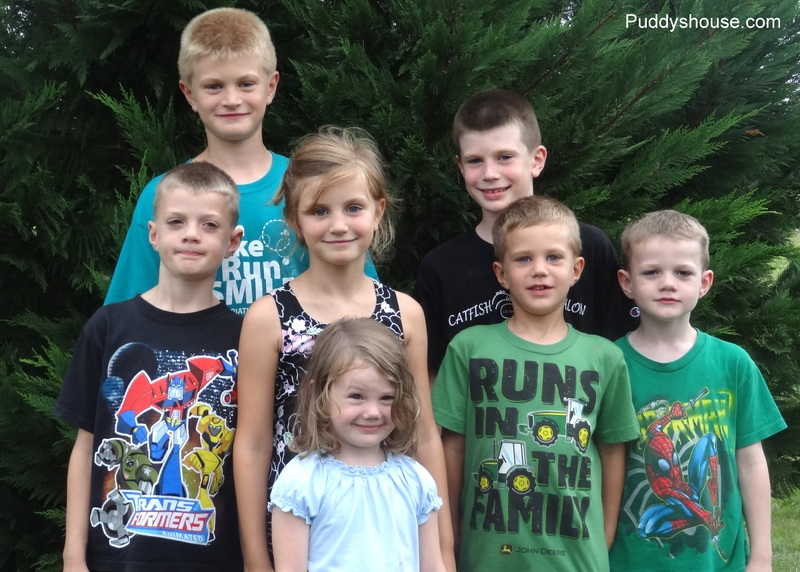 These are my seven nieces and nephews. There is an eighth one on the way thanks to my younger sister and her husband! Mom also enjoyed some cards and gifts from our generous family. This card was made by my sister and her children. 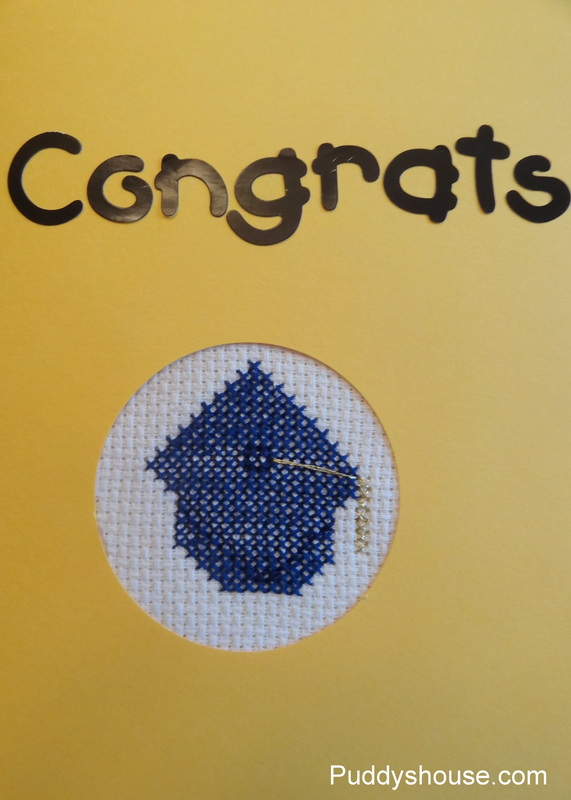 Her son cross-stitched the cap for the card. I will be putting my Cricut to work and creating a scrapbook of the pictures from the event as my gift to Mom. Leslie, it was an awesome day. Cute write-up except for the picture of me – lol. I thought your caps looked better than the pinterest ones. Thanks Mom! I think its a good pic of you.